Ladies and gentlemen – prepare to be amazed! We love it when a wedding moment pops up on our feeds and steals our hearts. This aww-worthy moment is brought to you by one of the biggest bridal squads we’ve seen, and oh did they slay. Houston beauty Charlye Lynne and her husband Stanley Egbo said “I do” in an ultra lavish Nigerian wedding ceremony recently, and the pictures are enough to break the internet. 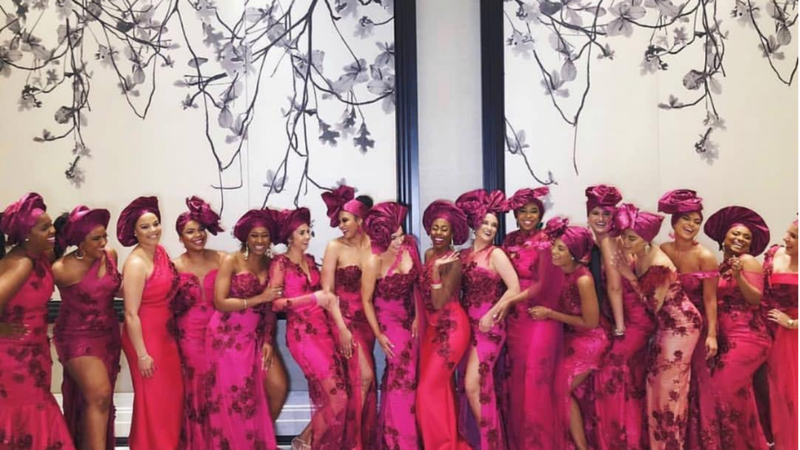 Charlye and her massive group of Aso Ebi Bellas slayed the scene in an assortment of fuschia gowns. This moment took our breath away! When they say go big or go home, this is what they mean. Also, how beautiful is the bride in her greeting gown by The Kloset?